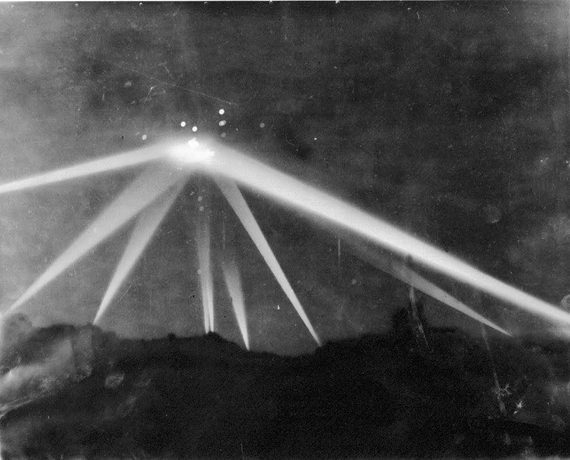 There was a lot said at the recent International UFO Congress near Phoenix, Arizona, about the supposed "Battle of Los Angeles" on the night of February 24-25, 1942, when many rounds of anti-aircraft shells were fired at - what? The heavily-retouched photo of the incident that was published in the Los Angeles Times. The white dots are fragments from exploding shells. David Marler, a diligent researcher, has accumulated an impressive collection of photos, newspaper stories, and other materials concerning the incident. I reviewed his talk at the Congress in a recent posting (also see the comments section). His conclusion is that something unusual was up there, but he doesn't know what. But for a different take on the matter, let us examine a first-hand account of the "battle" written by Col. John G. Murphy, who not only witnessed the shelling, but participated in an official investigation of the incident. Serious researchers realize that, the closer in time is an account to the event it describes, the more likely it is to be accurate. Col. Murphy wrote, "We interrogated approximately 60 witnesses - civilians, Army, Navy and Air commissioned and enlisted personnel... Roughly about half the witnesses were sure they saw planes in the sky." Given that no planes were ever sent up - not ours nor any Japanese - here we see another example that cautions us against taking "eyewitness accounts" at face value. There were no enemy air attacks on the West Coast. There were two submarine attacks by gunfire-one on Ft. Stevens, Oregon, and one on some oil docks north of Los Angeles. However there were many alerts, many blackouts. many alarms, and the antiaircraft troops were always in a pertinent condition of readiness. Prior to the battle of Midway there was a distinct tenseness all along the West Coast. We believed the Jap would attack Midway, but we also knew he could change his plans and attack any of the important cities of the West Coast. AA troops during this period were ready for any action. They were always ready for action, albeit sometimes overready or maybe even gullible-as was shown by the famous "Battle of Los Angeles." On Feb 26, 1942, the author was on a Staff visit to the 37th Brigade. Sometime after midnight I was awakened by the sound of gunfire. A quick glance through the window was not productive of any enlightening information. A quick trip to the roof of the hotel brought reward for the upward toil. It was a beautiful moonlight night, but the moon's magnificence was dwarfed by the brilliant glare of nineties and three-inchers spewing fire to the heavens, the glare and noise of the bursting shells, the delicate sky tracery of red and green forty-millimeters and fifty-calibers arching lazily through the skies, and the brilliant incandescence of the searchlights probing the heavens, hither and yon-up and down. A beautiful picture - a grand show! But at what were they firing? Imagination could have easily disclosed many shapes in the sky in the midst of that weird symphony of noise and color. But cold detachment disclosed no planes of any type in the sky-friendly or enemy. And suddenly all was quiet and only the light of the moon relieved the grim picture of a city in total blackout. I lingered on the roof, ruminated on what it was all about and was idly wondering if I could find my way to brigade headquarters through the blackout when all hell broke loose again. A cacophony of sound and a glaring brilliance again pervaded all! But soon it was over and quiet and darkness again descended on the awakened city. On my way to brigade headquarters next morning, screaming headlines in the morning papers told of the many Jap planes brought down in flames. At brigade headquarters there was much gloom. No one knew exactly what had happened. Maj. Gen. Jacob Fickel and Col. (later Maj. Gen.) Samuel Kepner flew down from San Francisco and with the writer constituted a board to investigate the firing. We interrogated approximately 60 witnesses-civilians, Army, Navy and Air commissioned and enlisted personnel. Roughly about half the witnesses were sure they saw planes in the sky. One flier vividly described 10 planes in V formation. The other half saw nothing. The elevation operator of an antiaircraft director looking through his scope saw many planes. His azimuth operator looking through a parallel scope on the same instrument did not see any planes. Among the facts developed was that the firing had been ordered by the young Air Force controller on duty at the Fighter Command operations room. Someone reported a balloon in the skv. He of course visualized a German or Japanese zeppelin. Someone tried to explain it was not that kind of balloon, but he was adamant and ordered firing to start (which he had no authority to do). Once the firing started, imagination created all kinds of targets in the sky and everyone joined in. Well after all these years, the true story can be told. One of the AA Regiments (we still had Regiments) sent up a meteorological balloon about 1:00 AM. That was the balloon that started all the shooting! When quiet had settled down on the "embattled" City of the Angels, a different regiment, alert and energetic as always. decided some "met" data was needed. Felt it had not done so well in the "battle" and thought a few weather corrections might help. So they sent up a balloon, and hell broke loose again. (Note: Both balloons, as I remember, floated away majestically and safely.) But the inhabitants of Los Angeles felt very happy. They had visual and auricular assurance that they were well protected. And the AA gunners were happy! They had fired more rounds than they would have been authorized to fire in 10 peacetime years' target practices. "Dr." Ken Johnston is a very colorful character. He represents himself as a former "civilian astronaut," "astronaut trainer," and "NASA Scientist," although he was none of those things. 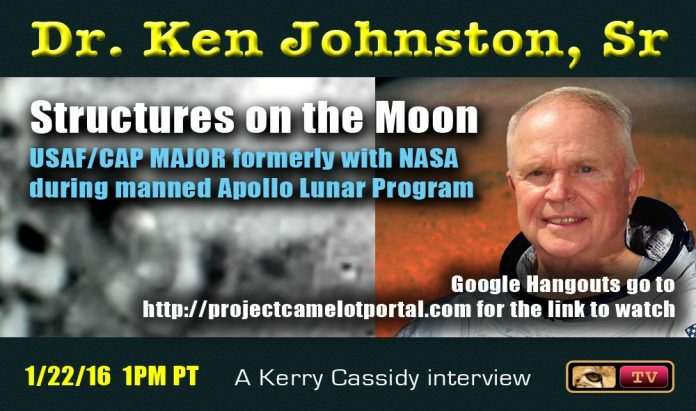 He tells all kinds of wild tales about 'alien structures on the moon' supposedly found in NASA photos that are airbrushed out of the photos that NASA releases, keeping the aliens hidden from public view (although Ken supposedly has the unretouched photos showing the alien bases). In fact, Ken now claims, after hypnotic regression, that ETs "trained him" to make disclosures of ET presence not only on the Moon, but also on Mars: "ASTRONAUT WHISTLEBLOWER KEN JOHNSTON REVEALS HOW ETS TRAINED HIM TO DISCLOSE UNTOUCHED NASA PHOTOS OF OPERATING MOONBASES AND ANCIENT RUINS ON MARS LONG BEFORE ARMSTRONG ARRIVED." 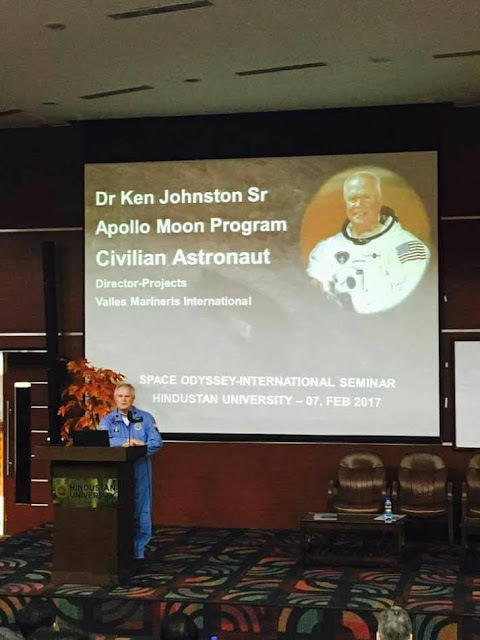 In early February, 2017, Ken went to India to speak at several science organizations. Here he seems to have represented himself as an actual astronaut. On February 12, the Indian newspaper The Hindu carried the story, "NASA astronaut visits BM Birla Science Centre." "A test astronaut, who is also chief trainer at the National Aeronautics and Space Administration (NASA) of the United States of America, Ken Johnston was bowled over by the enthusiasm that hundreds of students showed during a visit to the B.M. Birla Science Centre here on Saturday." Perhaps Ken was thinking that being thousands of miles distant from the U.S. would result in "what happens in India, stays in India." Not a good assumption in this Age of the Internet! Ken has a "Doctor of Metaphysics" diploma from a diploma mill, not an actual school. It does not have a campus, or instructors, or offer courses. Just diplomas. He was never an "astronaut trainer," or "scientist," let alone any kind of astronaut. Ken claims that he projected for a group of NASA scientists a 16mm film from Apollo 14, showing a pentagonal cluster of alien domes in the crater Tsiolkovsky. The scientists made knowing comments about the bases. Within 24 hours, NASA had altered the film, removing the alien bases. 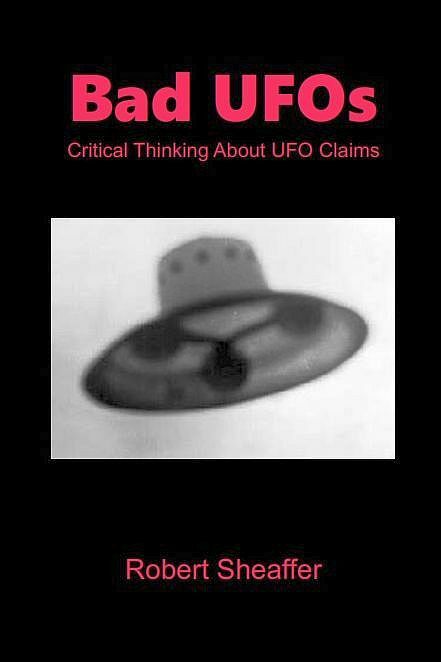 Within a few days of that being published, emails were circulating among some of the more 'serious' UFOlogists associated with the UFO Congress concerning Ken's credentials and background. For some reason, the job of defending Ken's background fell not to Ken himself, but to his colleague Bret Sheppard. (Perhaps it was because Ken was on his way to India.) Sheppard's defense of Ken's bogus "PhD" was so absurd that it made matters worse. I am genuinely impressed that Alejandro Rojas of Open Minds Productions (organizer of the International UFO Congress) and others were concerned with Ken's misrepresentations. If a speaker comes to the UFO Congress and spins absurd tales about government UFO conspiracies, that's basically OK. Everyone expects that. But if a speaker comes and represents himself as something he is not, then this reflects badly on the UFO Congress, and they are right to be concerned. At the end of Ken's talk at the Congress, he said, "tomorrow I leave for India." However, this time the result of his trip would be very different from the fawning enthusiasm he received the last time. 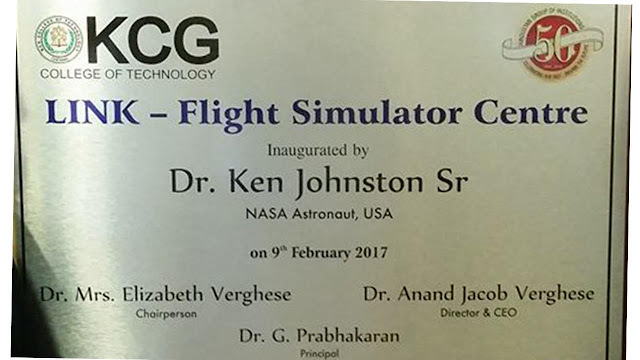 It seems that James Oberg was annoyed enough by Ken's imposturing in India that he informed NASA, who in turn informed the State Department that someone was posing as an astronaut and "chief trainer at NASA." Quicker than you can say "Glass domes on the Moon," Ken became persona non grata and was quite firmly asked to go home last Saturday. Guwahati/New Delhi, March 6: An Assam government science agency has found itself embroiled in a row kicked up by a former NASA associate who was invited to attend a conference here but was sent back the day he arrived. Ralph Kennedy Johnston Sr, who says he was formerly associated with the US space agency's Apollo lunar missions, has complained to Prime Minister Narendra Modi that the Assam Science Technology and Environmental Council (Astec) "deported" him without giving him a chance to defend himself. Johnston, in a letter to the Prime Minister's Office, has said he had attended educational meetings in Chennai, Hyderabad and Bangalore and had been listed as a "distinguished speaker" at a conference in Guwahati on February 28, National Science Day. But when he reached Guwahati on February 25, Johnston wrote, he was allegedly sent back to New Delhi the same day by Astec organisers. "I was sent to New Delhi without even being given a chance to defend myself. I had to purchase my own ticket back to the US for over $1,200, even though I had been brought to India (Assam) and had been promised airfare home," Johnston alleged. It looks like the Space Chickens have finally come home to roost. No wonder Ken's hosts in India were upset - they are stuck with this embarrassment.